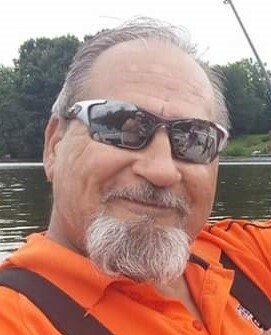 FULTON, NY – Patrick S. Garrett, 66, of Fulton, passed away unexpectedly on Monday, March 18, 2019, at his home. He was a lifelong resident of Fulton, retiring from Syracuse China as a machinist. Pat loved music, art and nature. He was very supportive of the arts, spending his time as a member of the Fulton Rocks group and engaging in the Color Me Shy app on Facebook. Surviving are his son, Aaron (Kristen) Garrett; grandson, Jackson Garrett; half-brother, Curt Daniels; two brothers, Michael D. Garrett and Guy Garrett; four sisters, Arlene Stacy, Julie Swift, Joanne Steinbecher and Diane Christenson; special relationship with his niece, Patricia Heppell and Zena Stacy; nephew, Daniel DeGouff; and his special little great-niece, Noelle DeGouff. Calling hours will be from noon – 2 p.m. Thursday, March 28, at Foster Funeral Home, 910 Fay St., Fulton. There will also be a celebration of life at 1 pm on Saturday, April 6, at the Fulton VFW, 216 Cayuga St., Fulton.